I went hiking 1 month ago in Kananaskis country, Alberta. It was snowing…quite strongly. The hiking was basically regaing strength after a long winter…sitting on a computer. But I was still snapping and when it is snowing, that excites “normal” photographers. 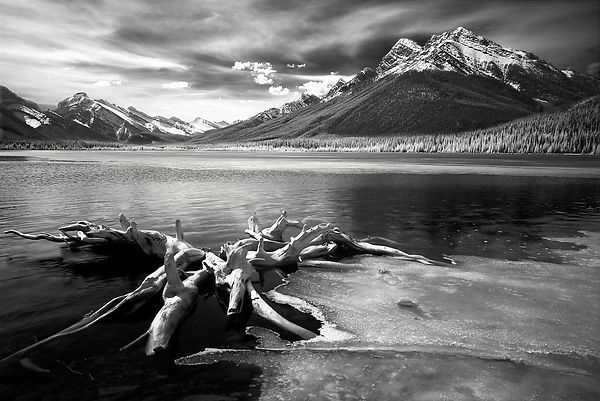 This entry was posted in Photography and tagged Alberta, B&W, black and white, Calgary landscape photographer, Calgary photographer, Canadian Rockies, fine art, Kananaskis, Landscape, Landscape photography, monochrome, Natue Photography, Visual Arts on May 1, 2015 by Hiro. 2014 was the year of the horse and I got some good luck from my horse images. I received several awards, including a photographic artist of the year. Now new year has come! The year 2015 is the year of the SHEEP. So I made a card with Japanese style. 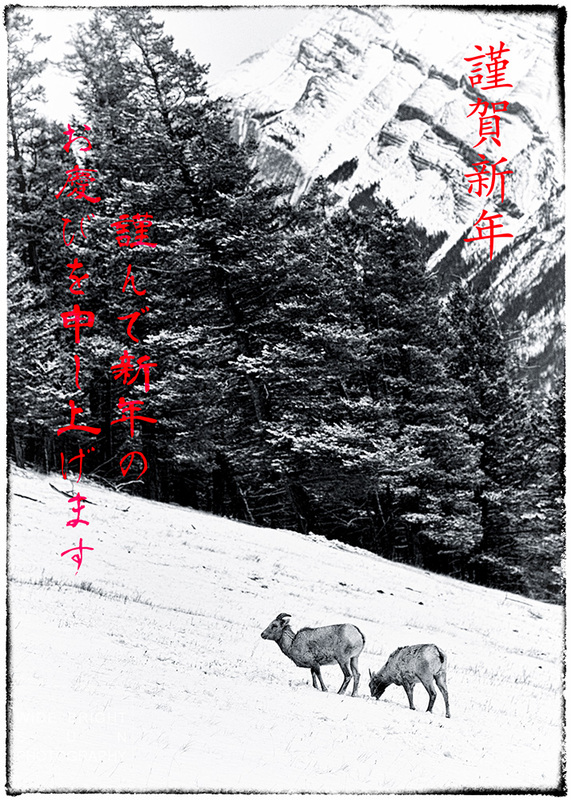 It says “Happy New Year” and “wishing joy in the new spring”. This entry was posted in Photography and tagged Alberta, Animals, Arts, B&W, Banff, black and white, Calgary landscape photographer, Calgary photographer, Canadian Rockies, fine art, Landscape photography, Visual Arts on January 4, 2015 by Hiro. 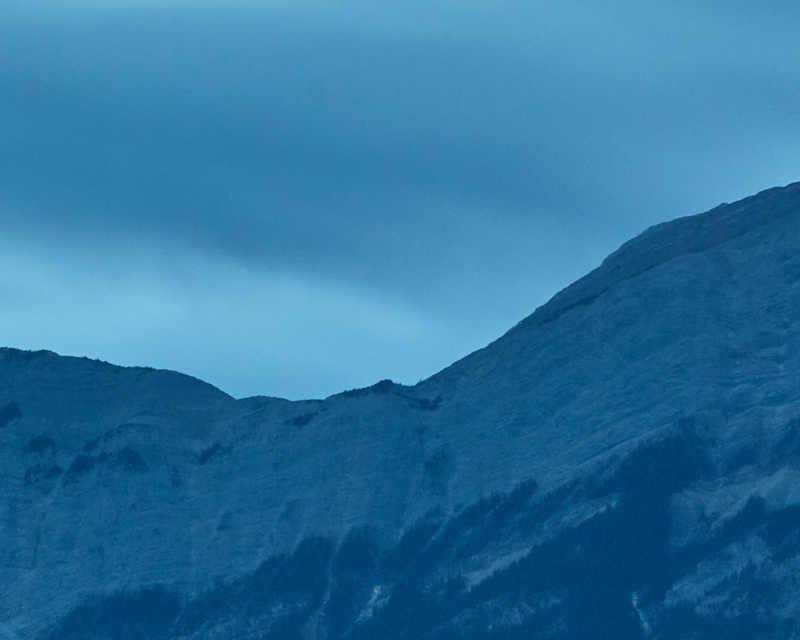 This images was taken in Abraham Lake, Alberta in this summer. I guess I arrived the area evening. The sun was already gone. Kootenay plains area is usually very windy. This day was also windy and the Abraham lake was white with form. Actually, this was the condition I had been waiting for. When attempting long exposure to white crested waves, the surface of lake or sea turns white, rather than black …kind of surreal. I used LEE Bigstopper and achieved 362 sec (6 min) of exposure time. By the way, I recently discovered Capture one, excellent Raw converter and photo management software. I have being using Adobe Lightroom for long time. 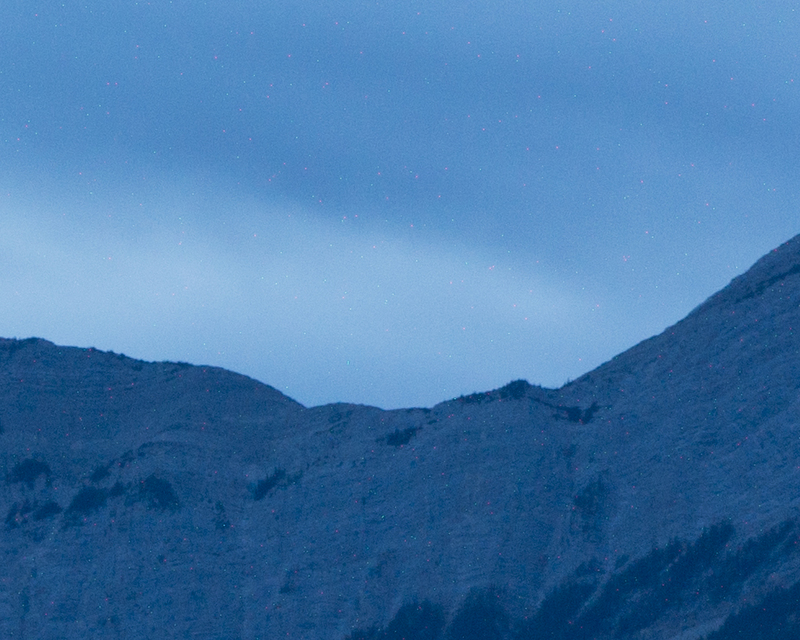 When opening Raw file to Photoshop from Lightroom I noticed many color spots of long-exposure noise was quite visible. On the other hand, the file from Capture one is cleaner. I could see some tiny white spots but they are not so significant. One day, I would to write a more thorough report. 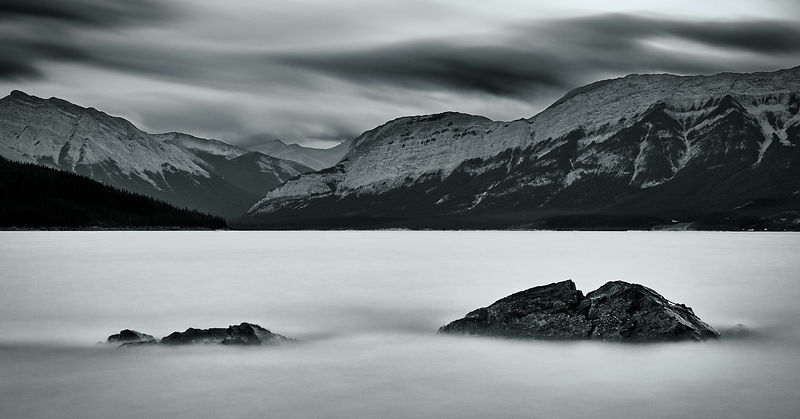 This entry was posted in Photography and tagged Abraham lake, Alberta, Arts, B&W, black and white, Calgary landscape photographer, Calgary photographer, Canadian Rockies, capture one, Digital processing, fine art, koota, Landscape, Landscape photography, Lee big stopper, Long exposure, Long-exposure photography, Natue Photography, Software, Visual Arts on December 4, 2014 by Hiro. At the end of August, I visited “Forget me not pond” in Kananaskis Country in Alberta with some PPOC members. The pond is basically for family activities and nothing like “landscape photography spot” photographers imagine. Also It was around 2 pm; the sun was way high up. Possibly, at this time of the day, I would take a nap in my car. But I am photographic artist of year of PPOC national competition. I should be able to come out some images. First thing my eyes caught was shining reflection of sun light on wavy surface of the pond. I was playing “out of focus”. I shot the reflection as out-of-focus, and creating rings of light in frames. Then I remember one of the purpose of this visit was testing my new gear, Nikon PC 24mm lens. At this point, I did not care about typical landscape photography. I wanted to do something with the shining and moving reflection of the light. So when using a tilt and shift lens like my new gear NIkon PC 24m, one of the purpose is obtaining hyperfocal focusing, technique to focus from foreground to infinity. But in this case, I wanted mountains and clouds to be on-focus, and foreground to be out-of-focus to get large bokeh of light ring. I could achieve it by tilting the lens to opposite direction from when we tilt for getting hyper focal focusing. You can try out Nikon PC 24mm lens and more lenses including Canon lenses in my fall workshop in Kootenay plains in Canadian Rockies. Please register from my website before sold out. This entry was posted in Photography and tagged Alberta, Arts, B&W, black and white, Calgary landscape photographer, Calgary photographer, Canada, Canadian Rockies, fine art, Hiro, Hiro Kobayashi, Hiroaki, Kananaskis, Landscape, Landscape photography, monochrome, Nikon PC 24mm, PC lens, Tilt and shift lens, Visual Arts on August 26, 2014 by Hiro. Award winning – Photographic Artist of the year 2014!!! 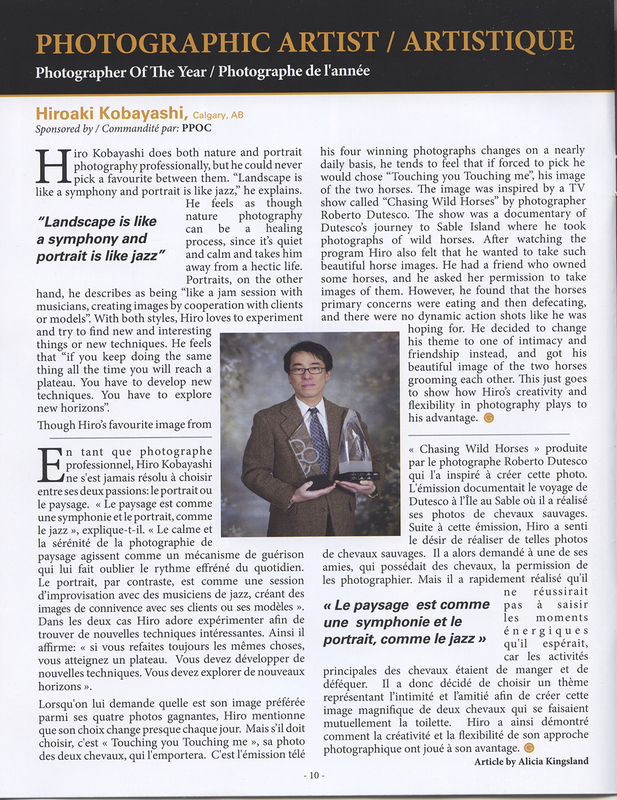 Professional Photographers of Canada (PPOC) holds image competition, called Image Salon every year. This year, the winners were announced in Winnipeg in May. Trophies are awarded to 4 categories including Portrait, commercial, wedding photographer and photographic artist. Winners have to achieve high quality images from all technical and artistic view point of photography for all 4 submissions. And…..I am a winner of Photographic artist of the year. This is exiting. I received a magazine, yesterday, from PPOC、carrying an article featuring the 4 winners. Please take a look the article. 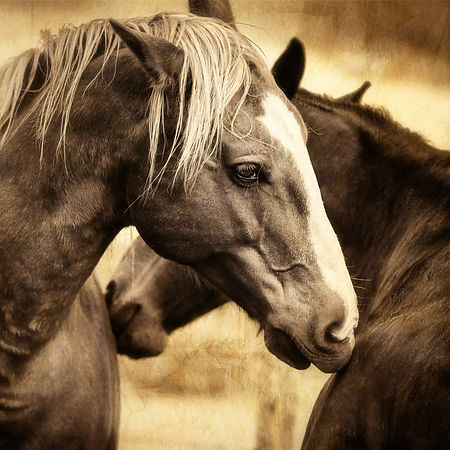 I mentioned about my attitude toward landscape and portrait photography, and how I found my styles of horse images. I should’ve written about the award earlier, but the reason is I did not have good a selphie. I knew this magazine is coming so I waited a photo of myself taken by a professional. I like photograph people, but no way myself! However, I would like to photograph trophies made of acrylic. This is challenging. I will post how it goes. Following is the winning images. This entry was posted in Photography and tagged Abraham lake, Alberta, Animal Portrait, Arts, award winning, B&W, black and white, Calgary landscape photographer, Calgary photographer, calgary portrait photographer, Canadian Rockies, fine art, horses, infrared, Kananaskis, Lake o'hara, Landscape photography, National Park, Photographic artist of year, ppoc, Professional Photographer of Canada, Visual Arts on July 11, 2014 by Hiro. I am helping organizing speakers for a small camera club in Calgary. I invited multiple award wining photographer, Olivier Du Tre as a speaker for the club meeting in May. 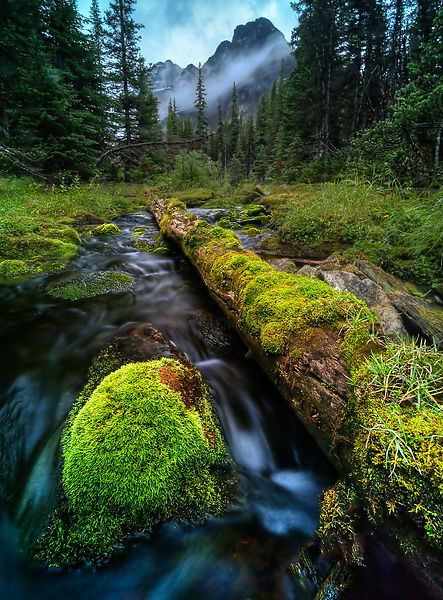 Oli is landscape/fine art photographer, residing in Cochrane, Alberta. He shoots only black and white, and furthermore, he totally switched to film recently. He mentions “zone” while others are referring Nike Silver Efex. He will cover many aspects of B&W photography in the presentation. Please check his website. Also the info about his presentation is here. So about my story how I started B&W and why I like B&W. When I became interested in photography about 20 years ago, I was suggested to try color slide film because it was considered to be more advanced compared to negative print film. One day, I took BEAUTIFUL sun rise shot on my trip. I thought it was glorious shot and showed to everybody at work. But one person said the photo was not remarkable. His reasoning was “Color dominates the image too much. Besides color, nothing to see”. And he recommended B&W film. I was pissed off, but anyway, I tried B&W. My first roll…I quite like images. But 2nd and 3rd rolls…I didn’t get good images. Usually, I got quite interesting or so disappointing images. Not so much between. Then eventually, I realized good composition made difference in photography. Color comes next to composition. Then I started printing by myself. I read many books about printing in darkroom. I could obtain prints by following text book. But I could not tell if they were good prints or not. I found a kind of the mentor and I showed my prints. I kept visiting him. I gradually learned “tone” or tonality was really important in prints and each master photographer had signature tone in his/her prints. Photography is picture by light. I realized light comes always first, even before composition. 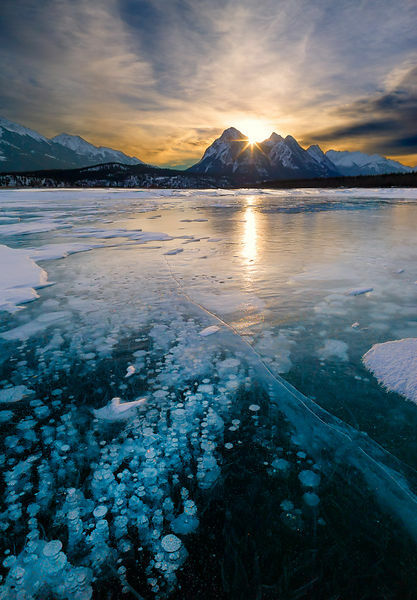 This is an image from Vermilion Lake in Banff in snowy day. I knew I could not expect gorgeous scenery including well-photographed Mt. Randal since the sky was still so grey. But I tried and I found this composition. All elements were line up vertically. When I grabbed my camera, the sun was a little off from the center so I waited about 20 min for the sun moving to the center. Actually, now I found I could apply more burning and dodging to this image to enhance the story I saw at the scene. No wonder many B&W photographer stay in a darkroom for months. Anyway, please check out, Oli’s amazing B&W photography in his website. You will see what I was talking about. This entry was posted in Photography and tagged Alberta, Arts, B&W, Banff, black and white, Calgary landscape photographer, calgary nature photographer, Calgary photographer, Canada, Canadian Rockies, controversy, film, fine art, Landscape, Landscape photography, Natue Photography, Photographer introduction, Style making, Visual Arts on May 5, 2014 by Hiro. In my last blog, each parts of the image were looked after　and vignetting was applied. It is getting close to what I imagined. But I felt the island, the woods at the center, was somewhat still weak as a main subject. So I need to spice up a little bit. I used “Curve” layers to modify contrast and brightness. But it did not give delicate control over the intricate patterns of the woods. So I used a different technique. Before showing the process, please allow me to talk about a little bit about conventional dark room process. In darkroom processing, can contrast be adjusted LOCALLY, like I did in my previous post? Originally, contrast was determined by a GRADE of the paper (#1 to 5, #1 is lowest contrast and #5 is highest) so the contrast can’t be adjusted locally. Then Multigrade paper was developed. With the MG paper, contrast was determined by different density of filters, placed between enlarging lens and the paper. The darker filter, the more contrast. By applying different density of the filter to particular part of the image, contrast can be adjusted locally. This is same as I have done in my previous post. As a more advanced technique, different densities of filters are applied to the SAME part. The principle of enlargement is same as shooting with a camera. It requires certain exposure time; it is just longer than shooting. Now please imagine you need 30sec to get proper exposure to a particular part of the image. With a moderate contrast filter, you get a result with lack of punch. 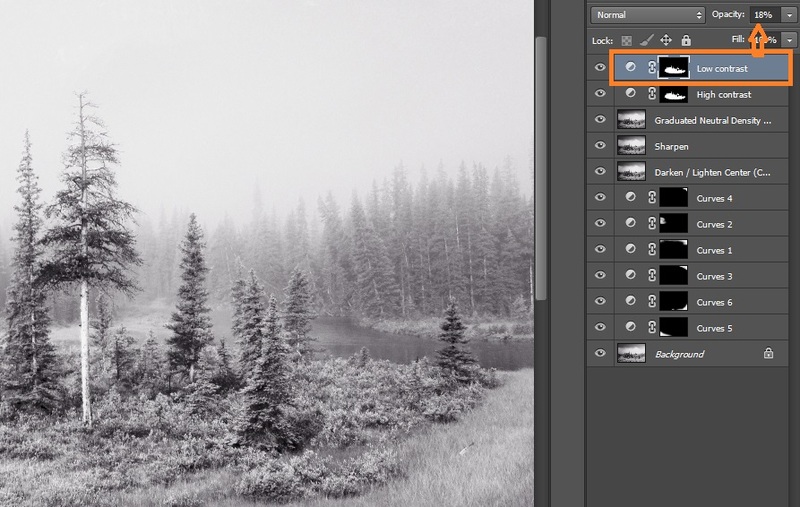 Now, you need more contrast but you don’t want to lose gradation of the tone. So what you can do is divide the exposure time (30 sec) to different filters. E.g, High contrast filter for 8sec, medium one for 15 sec and low contrast one for 7 sec to preserve the gradation. I use this technique for the wood part in digital processing. Step 1. Create a mask on the woods as precise as possible. Step 2. 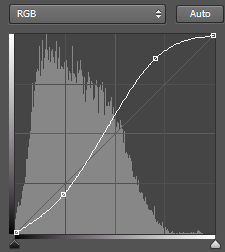 Create a Curve layer for high contrast. Please take a look a curve and the image below. Step 3. 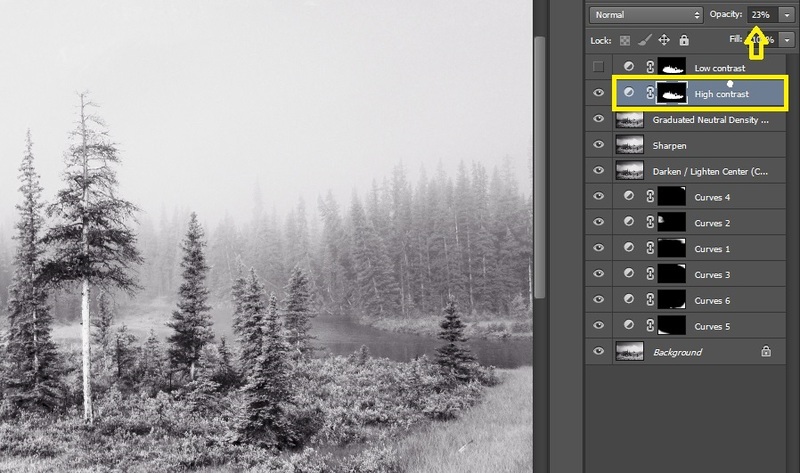 Create a Curve layer for low contrast. Step 4. 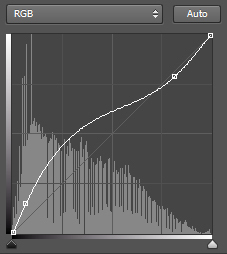 Change opacity of the each curve layer. The high contrast curve adds edges of lines but it will sacrifice tonal gradation. The low contrast will recover the tonal gradation. I find this technique is effective to clouds or hair. It is done. I saw bluish toning would suit this image so I added selenium toning by Nik SilverEfex. This is finally competed image. 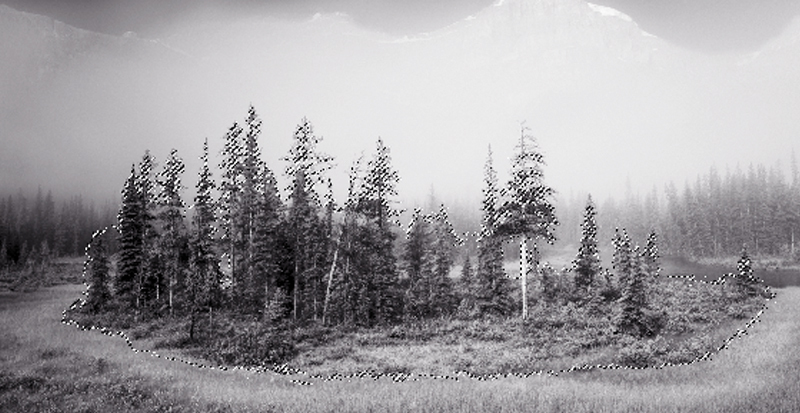 This entry was posted in Photography and tagged Alberta, Arts, B&W, Banff, Banff National Park, black and white, Calgary landscape photographer, Calgary photographer, Canada, Canadian Rockies, Digital processing, fine art, Landscape photography, monochrome, National Park, Natue Photography, Visual Arts on January 31, 2014 by Hiro.